Our current move has involved putting approximately 1000 boxes of books weighing approximately 1,000,000 lbs into storage: Art. History. Art History. Theatre. Theatre History. Obscure Writings on Theatre History… you get the idea. Which prompts me to wonder if my Dear Husband and others like him should form a chapter of Book Buyers Anonymous. In fairness, DH’s library is much better organized! DH navigates a bookstore or library the way I peruse the designer floor at Neiman Marcus or almost any bakery: eyes glazed, slack-jawed and bent double so as to read the title/label. It’s nearly impossible to leave empty-handed. Like chocolate and expensive perfume, scent is part of the experience: dusty, musty old books exude an irresistible pull, as does the cottony, slightly acrid crispness of a new volume. I used to share DH’s addiction but, much as I love to read, I don’t collect books the way I collect, say, shoes and bags. Once done, I almost never return for a second round of the same story. The library would be a perfect solution, except that I prefer the pristine quality of a new book to one that’s been handled by someone else. Hence, regular purchases of paperbacks, which can easily be recycled to friends, family or Goodwill. 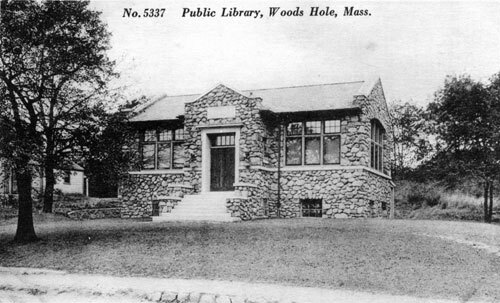 But as a kid the library was my safe haven, especially during the summers we spent on Cape Cod, when I had endless hours to curl up with a book. My childhood library was founded in 1875 and moved to its present stone building in 1913. It felt both vast and cozy. Also deeply welcoming, despite the looming presence of librarians who’d shush you if you happened to be giggling with a friend. I loved the dark, dusty stacks, the wooden files of Dewey Decimal System reference cards (named for the proprietary library classification system first published in the United States by Melvil Dewey in 1876), and most of all the sense of anticipation that you’d find something wonderful to bring home. Anyway. For the time being DH’s beloved boxes are safe and snug, though I have recurring nightmares of the second floor of our soon-to-be-built new home caving in under the weight of all those invaluable tomes. Maybe I should go bake something. This entry was posted in Observations, Uncategorized and tagged addiction, bloggers 50+, book lovers, books, libraries, moving, nostalgia, reading, Woods Hole MA, wordpress on July 5, 2018 by adguru101. You can’t! Arguments are inevitable; just accept it. We’re currently in packing hell, surrounded by boxes, bubble wrap and furniture that suddenly grew three sizes when we weren’t looking. Start every day by saying that no matter how much your partner will irritate you in the hours ahead, you love and forgive them in advance. Limit your fights to once per day. Tell your partner they’re right, no matter how idiotic their suggestion is. Work in different parts of the house. Have two tape rollers, markers and other materials so you’re not waiting impatiently for the other person to finish putting their box together. Encourage your partner to get rid of ugly crap from another life, ideally without identifying it as “ugly crap”. Drink heavily at 5:00 or as soon as practical (some days, this could be lunchtime). This entry was posted in Observations, Uncategorized and tagged bloggers 50+, fighting, funny, humor, moving, packing, wordpress on June 18, 2018 by adguru101.